Waterfront Home For Sale! A Concord Station treasure – This ECOSMART SEQUOIA is available now! Premier waterfront/conservation lot with NO BUILDER PREMIUM! Home built in 2014 and loaded with upgrades. 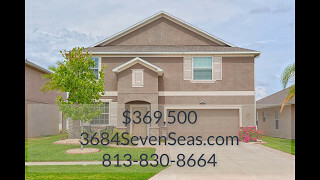 Enjoy 6-bedrooms and an office; 3-Living Areas; 3-Bathrooms; 3-Car Tandem Garage. With 3889 Square Feet, you will have plenty of room to spread out! As you enter this home you are greeted with a waterview in your direct line of sight. The floorplan provides two living and two dining areas, office, and guest bedroom /bathroom downstairs. The family room, kitchen, cafe area, and guest bedroom all have a great view. Upstairs is a generous loft area, the master suite and 4 additional bedrooms. Be sure to watch the videos! As you can see from the map – this home backs up to the only private fishing lake in Concord Station. Other options in the community are smaller ponds and accessible to everyone.